Powers/Abilities: Virgo usually employed an energy-siphon that she used on more than one occasion to shut down Iron Man's armor. Virgo was programmed after the Virgo sign of the Zodiac, and was particularly fond of money, seducing men, and relying upon proven tactics instead of taking risks. History: (Defenders I#48 - BTS) - Virgo was created in the "Theater of Genetics" by Scorpio, who wanted her to serve as a member of his Zodiac, and to be his friend and lover. (Defenders I#49 - BTS) - When the Defenders invaded the Theater of Genetics, Scorpio was forced to activate the LMDs prematurely. 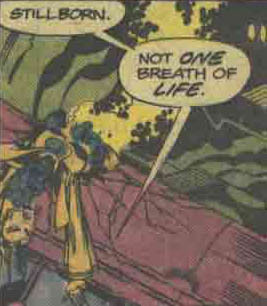 (Defenders I#50) - Unfortunately, Virgo never came life, and was found in her capsule by Scorpio, lying in pieces. Scorpio was so dejected at the loss of Virgo that he wound up taking his life. (west Coast Avengers II#26 (fb) - BTS) - Now existing as an LMD himself, Scorpio created a new Virgo using the Zodiac Key. (West Coast Avengers Annual#1) - Virgo joined the Zodiac LMDs in following Quicksilver in his attempt to gain revenge upon the Avengers. Virgo joined Libra, Scorpio and Leo in attacking the Keibler Circus. 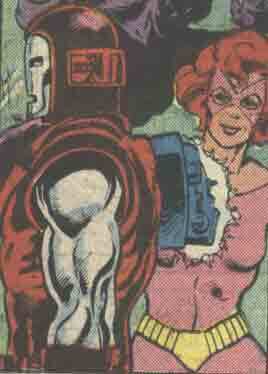 Virgo tried to seduce Quicksilver, but he rejected her, having decided that "flesh is a runner's enemy." In battle against the Avengers, Virgo managed to incapacitate Iron Man with her energy siphon, but she was then smashed face-first into the ground by Tigra. Virgo was later turned over to the authorities. (West Coast Avengers II#26) - After being set free from prison, Virgo joined the Zodiac LMDs in an attack on the human Zodiac Cartel in Dallas, Texas. They managed to kill all of the Cartel members except for Cornelius Van Lunt, and assumed their roles in the criminal underworld. Later, Virgo joined the LMDs in an attempt to rob businessmen at a cattle auction in Wichita, but they were interrupted by the West Coast Avengers. Virgo fought Iron Man, but fled the battle with the other LMDs when Hawkeye accidentally slew Sagittarius. Afterwards, Virgo was reprimanded with the others by Scorpio, who was disappointed in them for having run. (West Coast Avengers II#27) - Later, Virgo aided the LMDs in ambushing Hawkeye, who Scorpio replaced with his new Sagittarius LMD. Afterwards, Virgo attended a meeting with the LMDs as they bickered over how to defeat the Avengers. She noted that her own programming made their upcoming heist of the Denver Mint attractive to her. (West Coast Avengers II#28) - Virgo joined the LMDs in robbing the Denver Mint, but were interrupted by the Avengers, though Scorpio managed to teleport them to Death Valley along with their loot. When Leo again staged an attempt at wresting leadership from Scorpio, Virgo noted that Leo's sun was dominant, and a Virgo sun, making the two allies. However, the Avengers caught up to them once more, and Virgo clashed with Iron Man again, and attempted to use her energy-siphon upon him, but he was prepared for her. However, Scorpio's new Leo LMD managed to use the energy-siphon on Iron Man by attacking him from behind. When Scorpio brought the Avengers and LMDs to the Ankh Dimension, hoping to have an advantage, the LMDs were all shut down instead, leaving them immobile in the Ankh Dimension. Comments: Created by David Kraft, Keith Giffen, Mike Royer, John Tartaglione and Dave Cockrum.